Santa brought me an electric tongue jack. 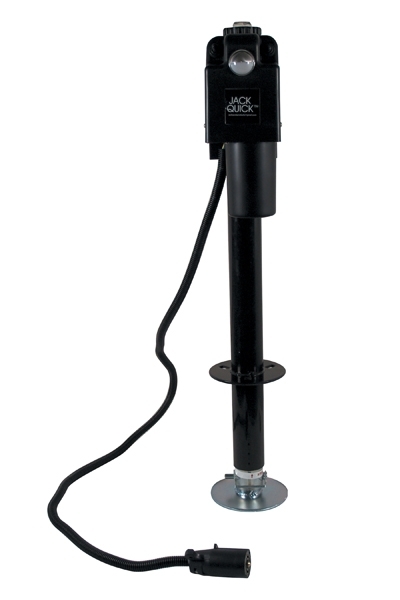 The Jack Quick 3500 (rated for 3650 loads). Smart ol' Santa! Install was amazingly simple, as the 21 here has built in threads where the unit is bolted down. The hard part was getting into the bolt heads, as they rest close to the jack tubes. As I didn't want to splice into power, I got the 7 pin model. Worked fine out of the box with the caveat that the jack is powered from the parking lights circuit (ie, turn on the truck lights to get power to the jack). Once I was happy with the install, I modded the plug to run off the hot 12V feed. The plug needs a dust sock though. While I have limited experience with power jacks, this one is much quieter than some I have had the pleasure of hearing in camping grounds. Somewhere around hair dryer level noise, maybe less. Also, the truck tailgate has even less range of motion to open now, as the head of the jack is larger than the stock unit's handle. I guess I have to think about a tongue box now. A decent, but long video someone posted on youtube. Got it for the smoking price of C$120 in my hands. Nice Christmas present, you will love it. Welcome to the power tongue jack club! That is nice but I love being able to open my tail gate otherwise I'd have one. With the WDH stinger my tailgate opens fine Jim. Guess that extra few inches that adds gives extra clearance. Of course, that's with a mid-size Frontier.